1410 14" Deck Drain - Jay R. Smith MFG Co.
Used in flat roofs and decks which are designed as parking decks or promenades for recreational purposes. Body and accessories are compatible for installation in all types of roof construction. Large square top blends in with "block" patterns and has sufficient open free area for proper drainage. Duco Cast Iron Body and Flashing Clamp with Seepage Openings and Secured Square Hole Heavy Duty Grate. Smith No. 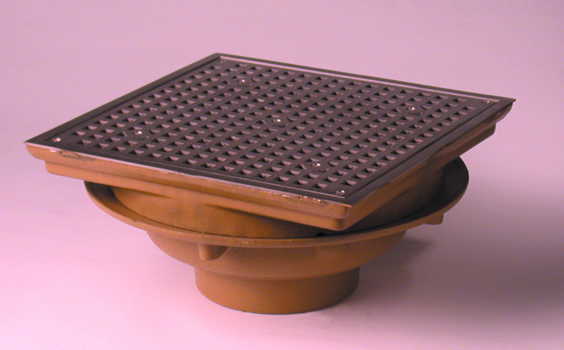 1412 cast iron drain and flashing clamp with secured 1/4” square hole nickel bronze grate veneered over ductile iron undergrate. For light pedestrian traffic supply Smith No. 1410. Smith No. 1410 cast iron body and flashing clamp with secured square hole nickel bronze grate.